Ireland should "prepare for the worst" and may need emergency aid from the European Union if there is a 'no-deal' Brexit, the former director general of the World Trade Organisation (WTO) has warned. Speaking on RTÉ's This Week, Pascal Lamy said a no-deal scenario has to be taken seriously because of the current divisions in the British government. And he said that in the event of no-deal Brexit the idea that there would be no border on the island of Ireland is "pie in the sky". 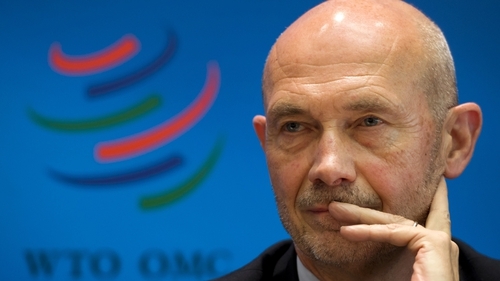 Mr Lamy, who was the WTO director general from 2005 to 2013, said: "To be frank, I am more pessimistic today than I was six months ago. The reason for that is the mess in London. There doesn't seem to be any majority in the House of Commons for any solution." He said there is a polarisation between hard Brexiteers and the soft Remainers or soft Brexiteers and this division currently "cannot be bridged." "Contrary to what I read in the British press, this is not a negotiation between the UK and the EU 27; it's a negotiation within the UK between forces that for the moment cannot agree on a solution." He pointed out that Britain was originally the strongest advocate of building the internal market as it recognised the benefits it brought. But he added: "If it was a benefit then, exiting the internal market has a cost. So there is no way there will be no cost, no way there won't be a border. If you exit the internal market you have to have a border." Asked if there are any borders anywhere in the world where there is no physical infrastructure, he replied: "No. The most open systems of trade which exist are either in South Africa, where there is the South African Customs Union since the early 20th century, and there is a border. And if you look at for instance Norway-Sweden, there is a border. "So the notion that there would be no border is pie in the sky," he added. "This is the reason why the EU has taken the issue of a backstop for Ireland. If there cannot be an agreement on the future trade regime and the UK exits in March next year, there has to be a solution that guarantees there will be no border between Northern and Southern Ireland." He said: "On the one side, there will have to be a border. On the other side, there can be no border between Ulster and the rest of Ireland. So this contradiction is there. It's unresolved and the backstop is the only solution to provisionally or maybe forever, resolve this contradiction." When Jacques Delors was president of the European Commission, Mr Lamy was his Chief of Staff from 1985 to 1994. Between 1999 and 2004, Mr Lamy was Commissioner for Trade at the European Commission under Romano Prodi. Asked how harmful a no-deal Brexit could be to Ireland and if he could see a situation where Ireland could need emergency aid from the EU in that scenario, he replied that a year ago he would have said there was a very low probability of Brexit without a trade deal. Now he encourages people running businesses to be aware that this is "the most costly" Brexit scenario and Ireland will face the brunt of it. "Yes, this is something that needs to be in our minds. Ireland would be most hit in quantity and proportion, and then there should be some sort of EU solidarity." He cautioned that there will be people across the continent who will question why they should foot the bill for Britain not reaching a solution. "This is something that we all need to prepare for and all need to have in mind," he said. Mr Lamy said the EU is about "solidarity with the smallest and the weakest" and the Irish question resonates a lot on the continent among EU leaders. He said: "There is a view on the continent that this Irish question is extremely sensitive. I don't think there is any risk the Irish will be let down on this question." Asked if the Irish Government had left it too late to start recruiting 1,000 customs and veterinary inspectors for ports and airports, Mr Lamy said: "I can understand why, until recently, people have not prepared for the worst case scenario, wishing that it will not happen and trying to not send signals that is the scenario for which they are preparing. "I think that it is not too late. The no-deal scenario is something we now have to take seriously while wishing it will not happen." Concluding he offered this advice to the Government: "Keep prioritising what matters most for Ireland which is no border, and prepare for the worst. Just in case."